So, I have finally finished my self-portrait, as a part of the assignment of writing the first blog entry – ‘The road to Multimedia Design’. I thought: “Great, I get to use my own photography straight away.” Yeah well, I was wrong. The main thing in the assignment was not to use just a single photo of oneself. For a self-portrait, I assume you are supposed to show who you really are, or what represents you. My initial instinct was to make a collage of the different things I like, as in interest, hobbies, personality wise etc. Eyes – Reflects the soul of a person. In photography, I love to enhance the eyes of a person when taking portraits. Nose piercing – I am often asked, “Why do you have that nose ring? You’d be prettier without it”. I normally respond something like, “Why don’t you have one? You’d look way better wearing one”. All in all, I am very fond of a darker side of creativeness and art. I am highly inspired by tattoo art and dark music lyrics/music/bands. Yes, I am a metal chick. 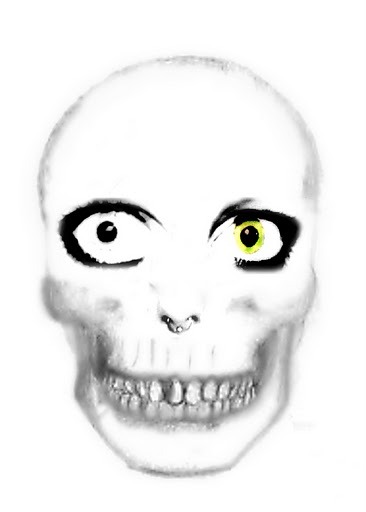 For the portrait, I sketched up the skull, scanned and uploaded it to my PC, used Photoshop on the photos I’ve used (eyes and nose piercing), and I’ve also used the program Picnic to adjust light, contrast and also the wrinkle remover to make the lines of the skull a bit more blurry. Does anyone have any feedback? This entry was posted in Introduction week, This is me. Bookmark the permalink.